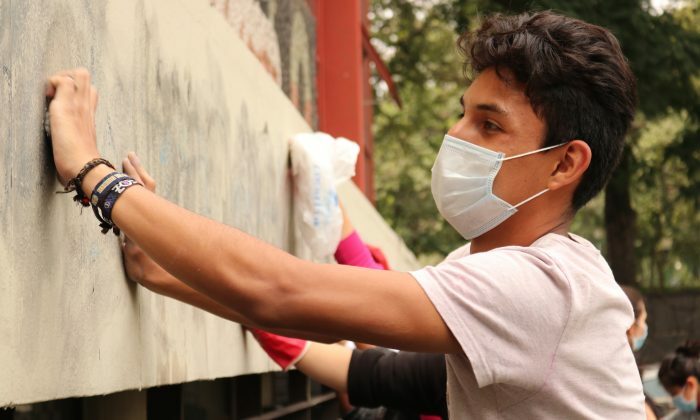 MEXICO CITY—It may have been a daunting task, but the group of a dozen or so students seemed determined to scrub the graffiti off the side of the most famous building on the main campus of the National Autonomous University of Mexico (UNAM), while wearing surgical-style masks to avoid inhaling the pungent mix of water and paint thinner. “We are for freedom of expression, but not like this,” said Karen Aketzali García Miranda, who joined the clean-up group on Sept. 7 at the end of a tumultuous week at the largest and most storied university in Latin America. Earlier that week, on Sept. 3, a group of students from one of UNAM’s many affiliated schools and colleges held a demonstration in front of the rectory at UNAM’s main campus. 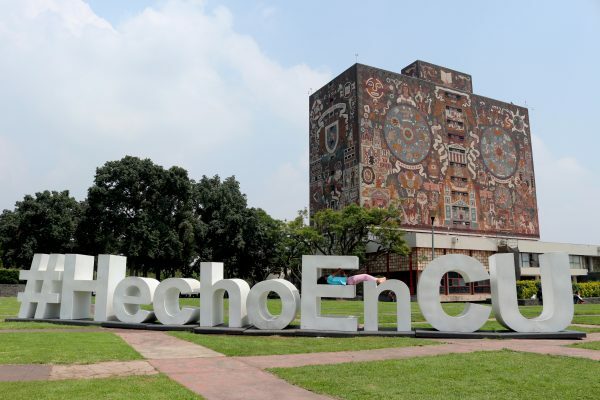 The gathering in the south of Mexico City was small, with the students intending to present a petition with a list of seven demands to UNAM Rector Enrique Graue Wiechers. According to reports, about 40 people arrived at the protest site in cars and proceeded to attack the students with sharp weapons, large sticks, stones, firecrackers, and Molotov cocktails. Fourteen protestors were injured, including two who sustained serious injuries—one of whom is thought to have been stabbed. The attacks were carried out by members of so-called “porros,” mercenary groups also known as “grupos de choque,” or “shock groups.” These gangs of young men are often officially registered as students but have a darker purpose than getting a degree. They are heirs to a long history of attackers, allegedly acting with the tacit approval of authorities intending to crack down on protests. The attack resulted in a much larger protest two days later, on Sept. 5, when about 30,000 students and faculty gathered on and around the esplanade in front of the rectory building to protest against the porros and express grievances against the university authorities and the Mexican government. 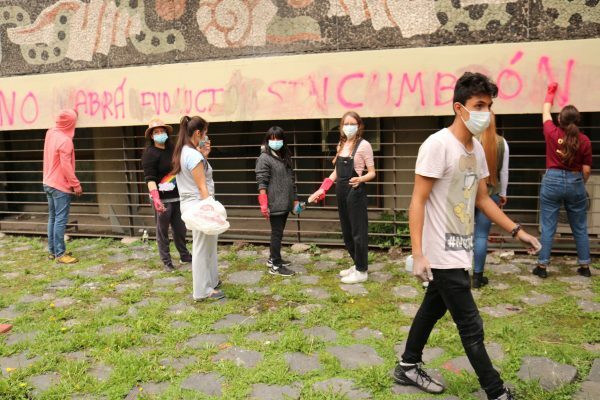 It was the graffiti from that march, scrawled in black and pink letters on the side of the Biblioteca Central, that the students encountered by The Epoch Times were attempting to clean up. “We are doing this clean-up because this form of expression used by some, be they students or people unconnected with the institution, is not the way to do it,” said Miguel Angel Romero Castillejos, an 18-year-old just four weeks into his course in urbanism at the Faculty of Architecture. “You can express things on banners and posters, but this World Heritage is for us and for them, too, after all.” UNAM’s main campus is a UNESCO World Heritage site. 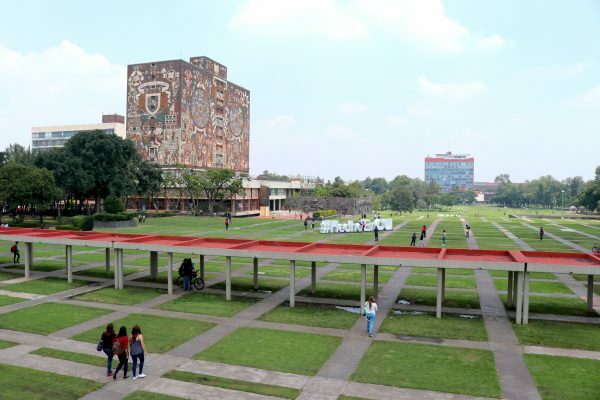 Standing and watching the students voluntarily cleaning the base of the library, a 13-story concrete building covered in an intricate mural celebrating the university and Mexico’s past, were two UNAM maintenance workers. Declining to give their names, they told The Epoch Times that the porros had made them afraid to do their jobs, although they didn’t say why such groups would want to stop them from working. When asked if they felt they had the support of the rector, they laughed. “No comment,” one said. The Epoch Times didn’t receive a response when the office of the rector was asked about the suggestion that maintenance staff didn’t feel they had the support of the university against the porros. A series of other questions about the events of this week were met with excerpts from a lengthy press release produced after the attacks, which UNAM’s Graue condemned as “barbarous and brutal” actions by the porros. All evidence possessed by the university about the incidents has been passed to the office of Mexico City’s attorney general, he said. Combined with this month being the fourth anniversary of the Ayotzinapa case, in which 43 student-teachers in the state of Guerrero disappeared, there is a multi-faceted backdrop of dissent toward official apathy and criminal impunity to the week’s protests at UNAM. Emma Rodríguez Romero is a postgraduate student at the Universidad Autónoma Metropolitana but was part of UNAM through high school and as an undergraduate. According to Romero, the porros are so entrenched in campus that her parents, themselves UNAM graduates, warned her about them when she joined the university’s College of Sciences and Humanities at its Oriente campus nine years ago. “They are paid for by many political parties and their own universities to maintain control through fear,” Romero said about porros. 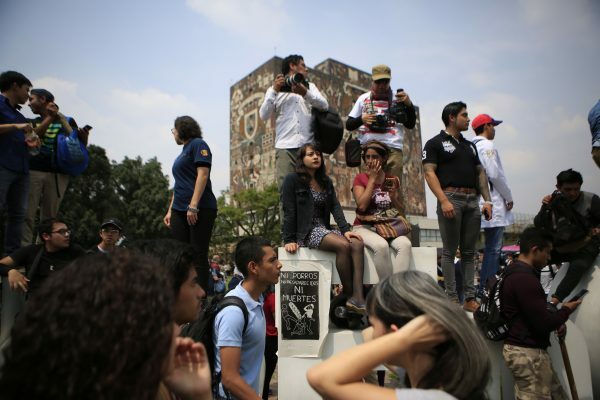 The failure of university authorities to rid their campuses of porros, of which there are 170 different groups and 52 at UNAM alone, according to a recent study, reflects broader failures of the Mexican state to tackle criminal violence, according to Romero. “I believe it’s a reflection of what is happening in this society—all the violence, all the corruption,” she said.